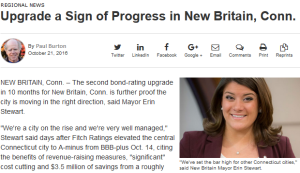 Mayor Erin Stewart’s fiscal responsibility has led to New Britain gracing the cover of the “Bond Buyer,” the nation’s top municipal finance newspaper – not once but twice. The city under her management is a shining example for how to make a financial turnaround work during a difficult economy. When Mayor Stewart took office four years ago, the City was on the brink of a state take over. The prior administration had left a $30 million deficit, the Grand List had declined by 17 percent (the largest decrease in 30 years), and many City initiatives, had been irresponsibility placed on the City’s credit card. Since then, Mayor Stewart has led an effort to create a $18 million Rainy Day Fund, increased the City’s bond rating from Standard and Poor’s by four notches to A+, and rescinded millions of dollars in bonded projects—all change that have led to the Grand List growing for several consecutive years. Upon taking office in 2013, Mayor Stewart revamped a plan to end homelessness. This plan is now known as Building Hope Together: New Britain’s Permanent Work Plan to End Homelessness. The plan involves a wide array of people and service providers from the community. All of the cross sectors from non-profit providers to mental health professionals and clergy collaborate on a regular basis to make sure the issue of homelessness is tackled from beginning to end. Under Mayor Stewart’s leadership chronic family homelessness in the City has been eliminated. There are also dozens of other chronic individuals who have been matched to stable housing and support services through this initiative. Thousands of dollars have been raised through events like the Building Hope Together Autumn Soiree to help support those in need by purchasing toiletries, bus passes, clothing and other necessities. Building Hope Together has become a national model for other communities, because of Mayor Stewart’s leadership and dedication to those in our community who are less fortunate. Some of the most priceless assets a city can claim are its streets and parks. Mayor Stewart has made it a priority to invest in the infrastructure assets of New Britain from the award-winning complete streets masterplan—which aims to make the roads more pedestrian and bike friendly—to the renovation of Central Park and the network of parks around the city. Some of the projects have included a multi-million dollar overhaul to Chesley Park in 2015, $6 million in upgrades to A.W. Stanley in 2018, constructing a new playground at Walnut Hill Park (paid entirely through donated funds) and more. Under Mayor Stewart’s leadership, the League of American Bicyclists has also named New Britain a Bike Friendly Community—one of only 8 communities in Connecticut. There are significant plans for remaking the Main Street overpass into the signature Beehive Bridge, which will open in the fall of 2019. This whimsical one of a kind project will also reconnect downtown to Little Poland and Broad Street. It is the gateway to the city and is appropriately situated at New England’s first rapid transit bus, CTFastrak’s main hub. All of this investment into infrastructure showcases the Mayor and City’s commitment to making the community a healthy, welcoming, and accessible place to be. 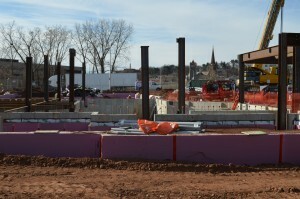 No other community in Connecticut has been as aggressive as the City of New Britain in obtaining federal and state funding to help pay for transit oriented development. Mayor Stewart has leveraged the opportunities presented by the opening of CTfastrak to turn vacant, or underused parcels along the bus rapid transit corridor to create a community where people of all ages and economic backgrounds want to live, work, and play. 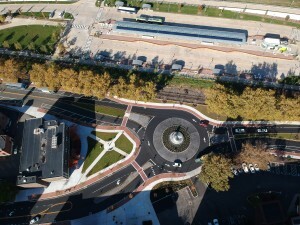 Under her direction, the City created a Transit Oriented Development Masterplan, a comprehensive guide (available at newbritainct.gov/TOD) that offers specific recommendations for moving forward to build a more walkable community for residents with concentrated areas of mixed-use development around the City’s three CTfastrak stations. One of these projects, already underway includes the $58 million Columbus Commons development at the site of the former New Britain Police Department. This project is fully funded and will feature more than 100 apartment units, along with ground level space for restaurants, retail shops, and office space creating hives of activity and new jobs. Mayor Stewart’s commitment to transforming these neighborhoods has attracted several other developments in the downtown area, including the historic renovation of 57 Court Street, along with additional apartments on Main Street, West Main Street, and several other areas around the city. Mayor Stewart, a former Board of Education Member, shares a unique perspective on education because she is a product of the New Britain public schools. Her partnership with the Superintendent of Schools, whom she meets with at least once-a-month to discuss the needs of the school system, has proven to be a great asset. The Board of Education budget is the largest chunk of the overall city budget and where most of the tax dollars are invested. A priority of Mayor Stewart’s administration has been to support the needs of our students and teachers. Since taking office, nearly $100 million has been financed by the City for school-related projects, such as the renovations to Gaffney and Smalley Elementary Schools. Mayor Stewart has supported the school district in other ways, such as advocating the state for more equitable Education Cost Sharing funding, donating from her Mayor’s Trophy Charitable Fund to student programs and athletic teams, allocating $120,000 to Holmes Elementary School to build a new playground, and a number of other initiatives near and dear to families around the city. In June 2016, the National Civic League named New Britain a 2016 All-America City because of the progress made to reduce childhood obesity, to stem summer learning loss, and to improve attendance rates. This year – New Britain was once again named an All-America City! The recognition this time stems from the continued progress made in all of the previous areas of concern and an increase in grade-level reading skills—particularly among low-income families. Mayor Stewart is proud to have a hand in guiding the district in these efforts. Efforts are underway to develop a comprehensive visitor’s guide, a new website for visitors (visitnbct.com), an online advertising campaign, video spots, and more. More than 100 decorative, streetlight banners featuring the new logo now line the City’s streets—at no cost to New Britain—helping to draw attention to local businesses and beautifying the City’s business districts with a unified look. In addition to bringing back pride to the city, Mayor Stewart has been influential in bringing about more community events to New Britain. 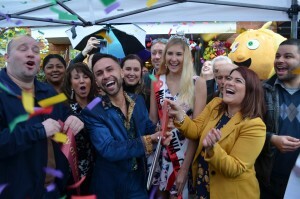 These events have included the return of Main Street USA, a weekly, Connecticut Department of Agriculture-certified farmer’s market in Central Park, a weekly lunchtime music series, a youth bike safety day, and countless events available to all city residents. Through the New Britain Commission on the Arts, the community has also become physically more vibrant through a popular High Voltage Art project, along with the Mayor’s Art in the Heart of the City exhibits at City Hall. Coming soon….BEES around New Britain! Mayor Stewart has made it a priority to make local government accessible and transparent to residents, business owners, and developers. Every month for the last four years, she has held open office hours, giving individuals an opportunity to chat one-one-one with the Mayor. She has a constant presence across various social media channels, participates in several monthly radio programs, provides previews of Common Council meetings on Facebook Live, is a constant presence in the news media, and strives to find unique ways to reach residents and business owners alike. She responds to inquiries both through the Mayor’s Office, by email, and through social media, where she has more than 16,000 followers. 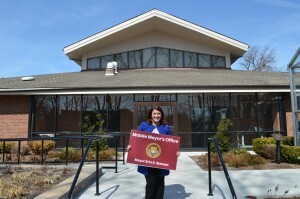 In March 2019, Mayor Stewart also began a new online show called “Bee Informed” to help provide residents with answers to frequently asked questions, a continuation of a popular show she had called “Around New Britain” that aired on Nutmeg TV. Recently, Mayor Stewart launched online agenda’s and city council packets through the city website. By a simple click of the mouse residents can view city business or watch democracy in action from the convenience of their home. Since taking office, Mayor Stewart has worked hard to make New Britain welcoming to businesses of all sizes. In January 2017, she implemented her second reorganization of City Hall, which resulted into centralizing several positions related to economic development. By having the economic development personnel all in one location it has made it easier for developers to get the information they need to start, relocate, or expand a business in the City. Since taking office, more than 60 new businesses have opened up in New Britain, creating hundreds of new jobs. Additionally, more than a dozen existing businesses have expanded, buoyed by the strong economic environment in the City. As a result, the Grand List has grown for five consecutive years, expanding the City’s tax base. New businesses included downtown eateries, two breweries, a nationally-recognized dance studio, manufacturing, and high-tech aero-space companies. In November 2018, the City’s unemployment rate declined to 4.3 percent, the lowest it has been in several years. When Mayor Stewart first took office, the unemployment rate was at 9.2 percent. In January 2016, Mayor Stewart launched an Energy and Innovation Committee (now known as the SMART City Committee) as a vehicle to establish New Britain as a “SMART City.” The goal of the committee is to reduce the cost of government, harness new technologies, and make more efficient use of existing resources. Projects recently implemented include a redesigned City website, a large solar array at the Shuttle Meadow Water Treatment Plant, electric vehicle charging stations, a fuel cell at New Britain High School, LED lights in City buildings, free downtown wireless internet, downtown parking meter upgrades, and a whole host of green energy projects. 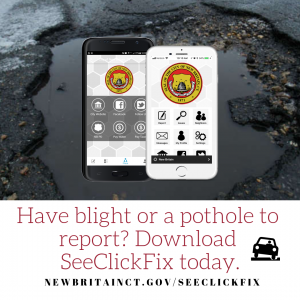 Other initiatives have include a mobile app called SeeClickFix that allows residents report a pothole or other issue directly to Public Works, upgrading downtown traffic lights so they can be realigned in real time, and a free textile recycling program. 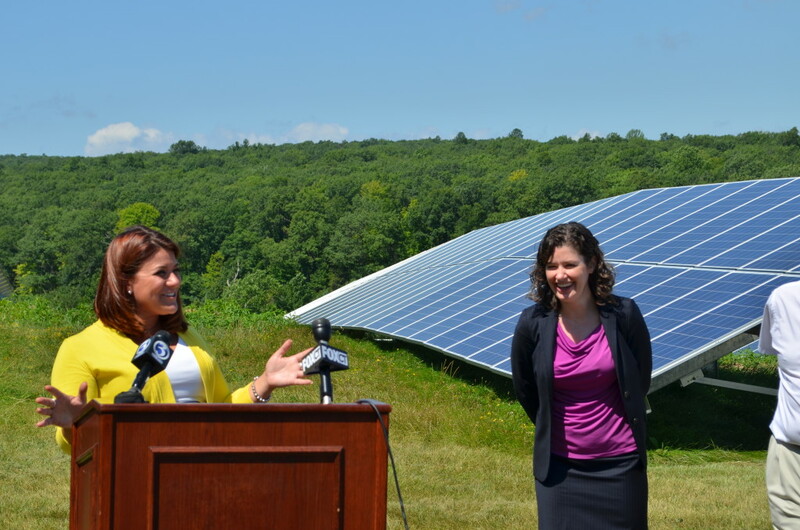 Mayor Stewart has also made a commitment to reduce electrical costs by at least 10 percent. As a young leader who is recognized around the state and nation, Mayor Stewart never passes up an opportunity to inspire other individuals—especially the children who call New Britain home. During her time as Mayor, Stewart has dedicated many hours to help develop the confidence and leadership qualities students need in order to grow and succeed. She is constantly advising them to give back to their community, or organization. 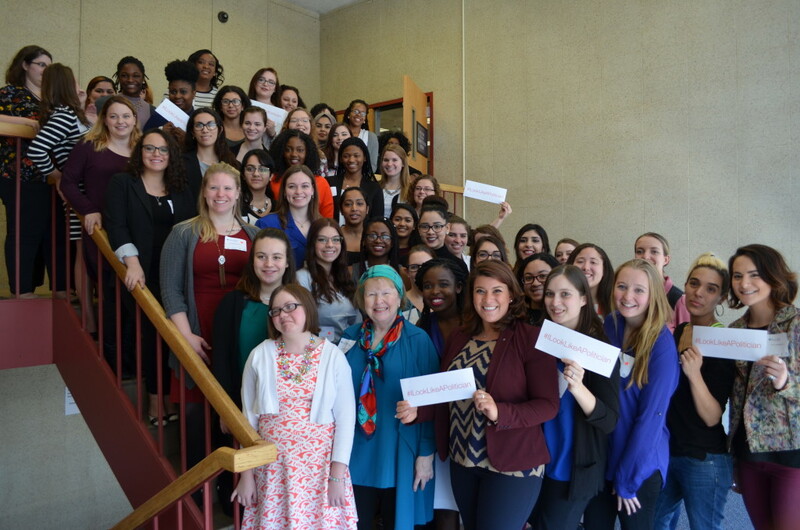 A former volunteer New Britain High School softball coach, Mayor Stewart has been a keynote speaker at the Connecticut Business and Industry Association’s “When Women Lead conference”, a repeat speaker at Central Connecticut State University’s “Elect-Her” series, and a frequent visitor to area schools where she is proud to instill a lifelong pursuit of learning.